Kristina McMorris is a New York Times and USA Today bestselling author and the recipient of more than twenty national literary awards, as well as a nomination for the IMPAC Dublin Literary Award, RWA's RITA Award, and a Goodreads Choice Award for Best Historical Fiction. Inspired by true personal and historical accounts, her works of fiction have been published by Kensington Books, Penguin Random House, and HarperCollins. Kristina's novel, Sold on a Monday, follows her widely praised novels The Edge of Lost, The Pieces We Keep, Bridge of Scarlet Leaves and Letters From Home, in addition to her novellas in the anthologies A Winter Wonderland and Grand Central. Prior to her writing career, she hosted weekly TV shows since age nine, including an Emmy Award-winning program, and has been named one of Portland's "40 Under 40" by The Business Journal. She lives with her husband and two sons in Oregon, where she is working on her next novel. This bio was last updated on 06/20/2018. We try to keep BookBrowse's biographies both up to date and accurate, but with many thousands of lives to keep track of it's a tough task. So, please help us - if the information about this author is out of date or inaccurate, and you know of a more complete source, please let us know. Authors and publishers: If you wish to make changes to a bio, send the complete biography as you would like it displayed so that we can replace the old with the new. For the characters in this story, their journey started with a pictureand the same can aptly be said of my endeavor to write this book. 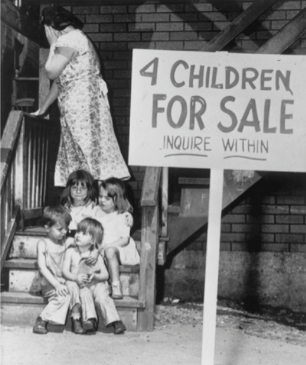 When I first stumbled upon an old newspaper photo of four young siblings on the steps of an apartment building in Chicago, their mother shielding her face from the camera, the sign in the foreground stunned me. The photograph, which first appeared in The Vidette-Messenger in 1948, troubled me so much that I bookmarked the page on my computer. (One of many odd compulsions that differentiate historical fiction writers from normal people.) As a mom myself, I kept wondering what could have possibly pushed a parent to that point. In the direst of times, I could fathom perhaps having to give up my children for the sake of their well-being. But why on earth ask for money in return?